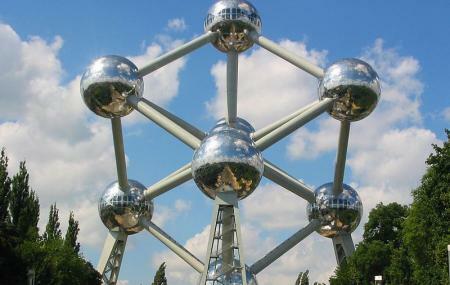 Built for Expo 58, the 1958 Brussels World Fair, this 18 metre stainless steel structure is one of the coolest buildings you'll ever see in your life, from the inside or out. It's the exact shape of an iron crystal, magnified 165 billion times. Inside the sphere is a museum covering the Expo and the World Fair and the creation of the Atomium. The exhibits are mostly documents, photographs, souvenirs and videos. If that sounds boring, don't be put off. This is one of the most visited buildings in the city. There is a children's workshop and play area. And there is a 360 degree panoramic rooftop restaurant too. Also, visit the popular attractions in the city by following Brussels itinerary 3 days. Check out the snack area at the terrace or the Belgian Taste Panoramic restaurant. Guided tours for 25 people max. Reserve your spot. Tours last 90 minutes. No smoking or food allowed inside. December 24th and 31st: Ticket office closes at 3:15 pm. Last admission at 5:30 pm. People normally club together Atomium And Mini Europe and Atomium while planning their visit to Atomium.